There’s nothing quite like the Singapore Grand Prix. This amazing venue has swiftly established itself on the calendar as one of the premier venues of the sport, not only because of the circuit itself, but also because of the glitz and glamour that goes with it. Held under floodlights, F1’s only full-night race is spectacular. It also hard. Held in hot, humid conditions that boil the drivers in their cramped cockpits and stuffy, flame-proof suits, the track provides challenges for other reasons too. Firstly, the circuit (being a street track) is bumpy. It rattles the drivers like no other venue. Secondly, the race runs very close to (and often hits) the two-hour time limit set for F1 races. All in all, everything about the circuit conspires to provide the drivers with an immense challenge. Is it a coincidence that only champions have won here? Like only a very few tracks, Singapore is a counter-clockwise race, and features several sharp corners. 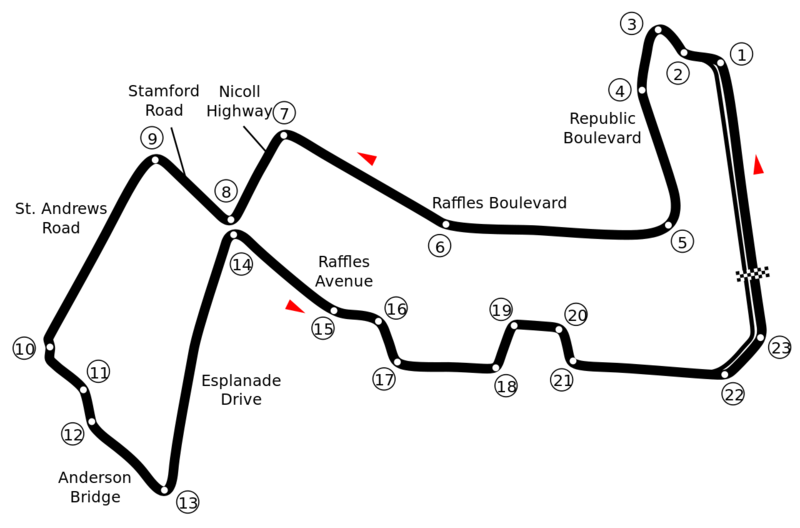 The opening sequence is a left-hander, followed by a dinky right corner, immediately followed by a left hairpin, and then a quick dive toward turn 5, which is a little faster than it looks, but with barriers on either side of you, your focus needs to remain sharp, for one twitch, one little mistake, and your race is over. Next is a tight left-hander at the end of a DRS zone, and then punchy right and left-handers in quick succession. Turn 10 is not what it used to be. A chicane with high kerbs used to bounce cars here, but it’s been turned into a more conventional corner following concerns about safety. Several tight corners later, you arrive at the end of the lap, suitably jostled. Last year’s race was memorable for two reasons. Firstly, the complete failure of Mercedes to be competitive. Inexplicably, they lacked pace, but Singapore is a track that suits downforce rather than raw power, and therefore the Red Bulls in particular might fancy their chances here. Ferrari might also go better here than in previous races. The second reason last year sticks in the memory is for the act of outrageous stupidity of a spectator, who decided to take a casual stroll down the side of the track. So what’s the situation, championship-wise? Mercedes’ Lewis Hamilton leads by just two points from teammate Nico Rosberg, who has won the past two races. As alluded to, Mercedes struggled here last year, and the Red Bulls could go well here. Might they interfere with the title battle? The potential is certainly there for drama, and Singapore usually serves up exactly that.